Gatorade is a brand name commonly associated with athletes and sports of all kinds. However, other sports drinks have entered the market over the years, giving Gatorade some healthy competition, and choosing what sports drink to consume has become confusing. Although Gatorade can help you to effectively hydrate and replenish your energy, there is little evidence to suggest that it is more effective than a sports drink with similar ingredients. However, subjective elements, such as taste, might be considered an advantage. Gatorade was created by researchers at the University of Florida in the 1960s to help the school football team hydrate effectively. Gatorade is mostly water, but it also contains a 6 percent carbohydrate blend in the form of the sugars sucrose, glucose and fructose, which helps to replenish lost fuel in the muscles. In addition, Gatorade contains several key electrolytes, including sodium and potassium, to help replenish the electrolytes lost when sweating. Electrolytes play a key role in proper muscle contraction, while glucose and sodium both enhance fluid absorption in the body. 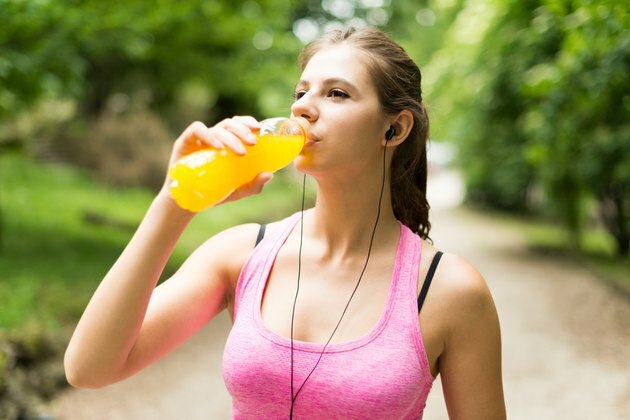 When comparing sports drinks, it's important to realize that different kinds are available. According to sports coach Brian Mac, the three basic kinds of sports drink are isotonic, hypotonic and hypertonic. Isotonic drinks, like Gatorade, contain fluids, electrolytes and 6 to 8 percent carbohydrates. Hypotonic drinks contains fluids, electrolytes and low levels of carbohydrates, while hypertonic drinks contain more than 10 percent carbohydrates. Most sports drinks on the market fall within the isotonic category, including Gatorade, Powerade and AllSport. In a study published in the March 2000 edition of "Sports Medicine," researchers at the University of Tasmania in Australia reported the results of a meta-analysis that looked at numerous studies performed on commercially available sports drinks. Their research focused on studies that included drinks containing less than 10 percent carbohydrates, which includes Gatorade, and were geared toward the average athlete. The researchers concluded that there was little evidence to suggest that one particular sports drink was more effective than another. If you are exercising less than an hour, drinking water is the best way to hydrate, according to registered dietitian Mitzi Dulan. Your body simply doesn't need the extra carbohydrates or electrolytes, although if you don't like water, drinking a sports drink is better than not drinking anything. If you are engaged in more intense activity, a sports drink can help you hydrate and replenish your muscles. Dulan recommends choosing a drink that is 5 to 8 percent carbohydrates and has 120 to 170 milligrams of sodium. It's also advisable to choose a drink that tastes good to you because research has shown that it increases consumption, according to Dulan. Sports Medicine; The Effectiveness of Commercially Available Sports Drinks; J.S. Coombs et. al.